You are here: Home / Blogging / How to WIN at a Twitter Party -Twitter Party Tips! 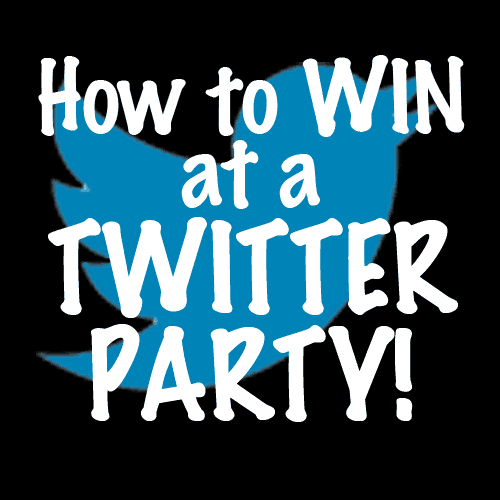 How to WIN at a Twitter Party -Twitter Party Tips! Just remember that most of the time it is a numbers game and that is why I LOVE twitter parties. Usually you can get in one with anywhere from 75-200 people tweeting and a lot of times they have up to 10 sometimes 15 prizes! Do you know what that means? The odds of winning are great. The winners are usually picked at random, but sometimes they are picked based on how much you tweet. Sometimes winners are picked per the questions that you answer. So here are my tips if you are thinking about joining in on a party! How to WIN at a Twitter Party! Twitter Party Tips! 1. Be sure to RSVP. Most twitter parties will have a link where you will have to sign up. 2. Figure out who is asking the questions. Some parties get confusing when there are multiple people asking questions, but MOST of them only have one main host. 3. Always use the HASHTAG when partying on tweeting! 4. Get the hosts attentions and interact with them. 5. Every question that is asked, be sure to retweet, reply (and don’t forget that hashtag), and then favorite (just get their attention). 6. Another tip, is I bookmark all the HOSTS on my bookmark bar. Then throughout the party I click on each one of them and make sure I respond to all their tweets (retweet, reply, and favorite) because you never know who is randomly picking a winner. 7. Get tweet happy, tweet a lot and write relevant tweets because more people will interact with you! how awesome – I just started participating in these twitter sweepstakes, so this came at the right time – thank you very much – blessings!